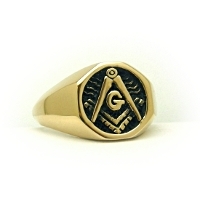 Brother Drew, Slipped the Classic Signet ring #005 (the first in Gold) on my finger this afternoon. As I told you in an e-mail; the night I passed my 3rd degree proficiency my father gave me a Blue Lodge ring set with the diamond from my mothers' engagement ring...that ring is now in the safe. This ring gives me the same sense of pride wearing it; I hope that says something. This ring is a CLASSIC representation of a ring that announces the wearers' affiliation. You have outdone yourself with this ring. It, and my apron, will go to the grave with me. Thank you, Brother.